Models 936, 1456, 2906 and 6506 were designed as economic options for raising and lowering curtains on projects where lift speed is not critical. These machines are not equipped with friction brakes and may drift after the stop command is issued. A fairly high reduction in the gear unit helps minimize this drifting. Stop, Start and Reverse action is provided with a reversing motor and three-position maintained toggle control switch. 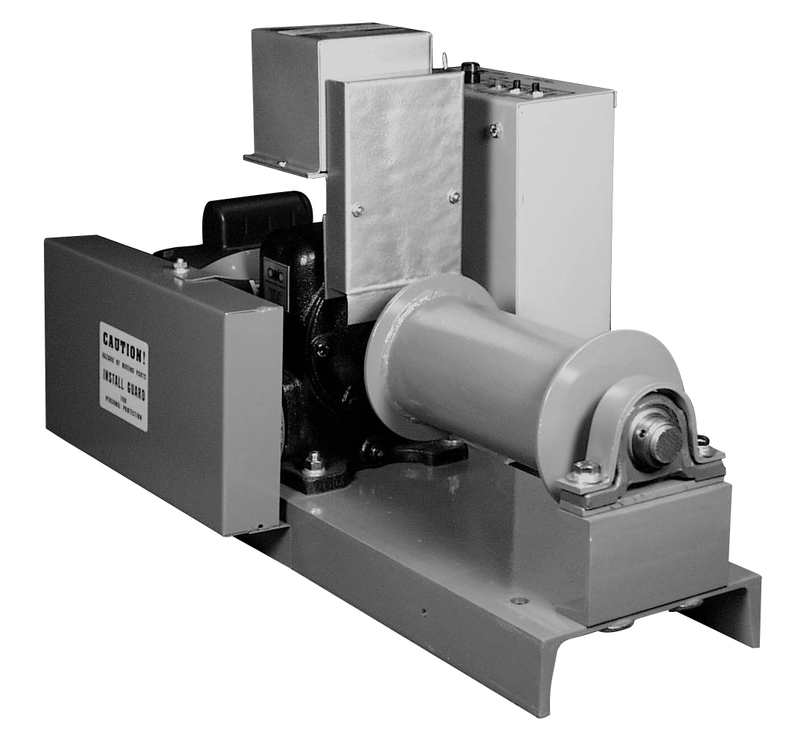 Integral rotary limit switches are provided the for "Full Raise" and "Full Lower" positions. Curtain machines shall be fully automatic type equipped with ... HP special reversing motor connected through V-belt drive to single reduction gear unit, on the output shaft of which shall be mounted in elevator-type un-grooved steel cable spool delivering lifting speed of 18 feet per minute. Remote control switch shall provide reversing action at any point along elevated travel and shall be composed of three-position, maintained contact toggle-type switch. Integral rotary limit switch shall be driven from output shaft of gear reduction unit. Machine shall be equipped with disconnect switch, overload protective breaker, and emergency hand crank for conversion to hand operation. The entire mechanism shall be mounted on a steel base. Model ... as manufactured by Automatic Devices Company of Allentown, PA.